Product prices and availability are accurate as of 2019-04-22 19:02:15 UTC and are subject to change. Any price and availability information displayed on http://www.amazon.com/ at the time of purchase will apply to the purchase of this product. The Altelix NP171406GV Green Vented Polycarbonate + ABS NEMA Enclosure is ideal for protecting equipment from harsh environments and tampering. Equipment designed for indoor use can now be located outside. 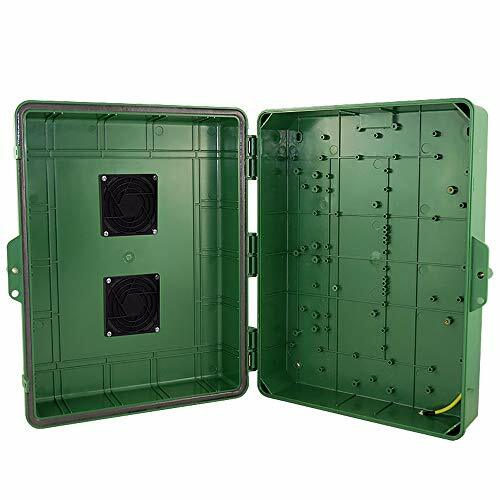 These enclosures are molded out of green UV resistant PC+ABS, a high tech thermoplastic blend of polycarbonate and ABS which combines the best qualities of both into a single material. PC+ABS enclosures are superior to ABS enclosures because they maintain high toughness, durability and dimensional stability even at extreme cold and hot temperatures. 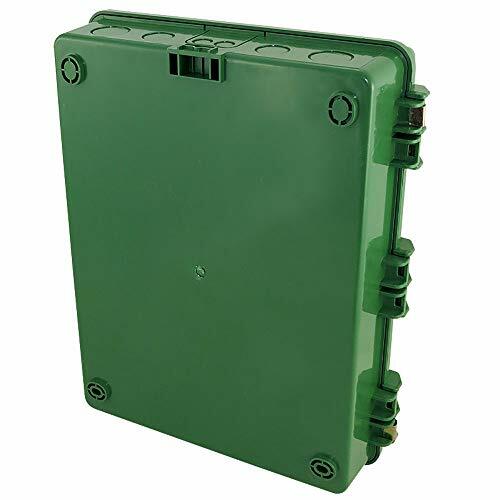 The green color of the NP171406GV makes it ideal for deploying surveillance and security equipment as well as irrigation controllers, WiFi equipment and building automation control equipment which typically requires low visibility. It can easily blend in with indoor and outdoor gardens and landscapes. This enclosure is IP24 rated and features a fully gasketed door to protect from dust and water ingress. The door features reinforced hinges, dual latches and a tamper-proof locking screw with key to secure the enclosure. This enclosure features two 3 inch air vents. Rain shields help prevent rain water from entering the enclosure. 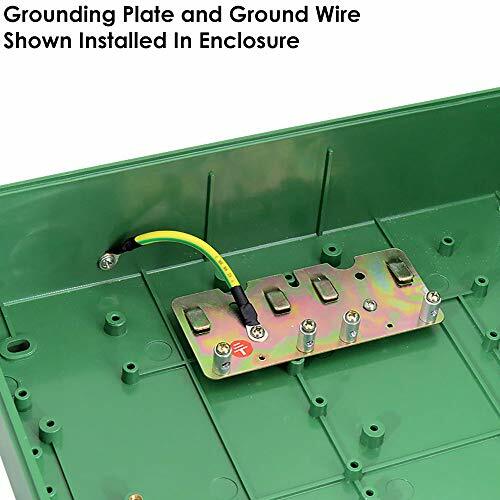 The enclosure can be wall mounted using the included wall anchors. An optional pole mount kit is also available for installation on poles up to 8 inches in diameter. 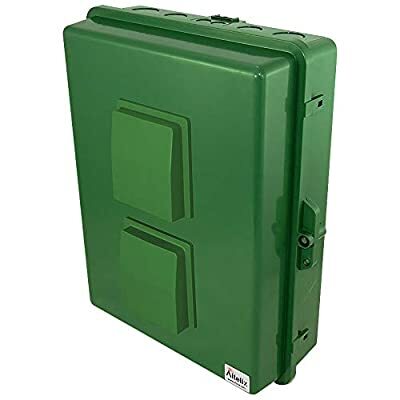 Durable Commercial Grade Green Polycarbonate + ABS Vented NEMA Box with Reinforced Hinges, Dual Latches, Tamper-Proof Locking Screw and Provision for Padlock. Dual 3" Vents with Rain Shields to Expel Heat. 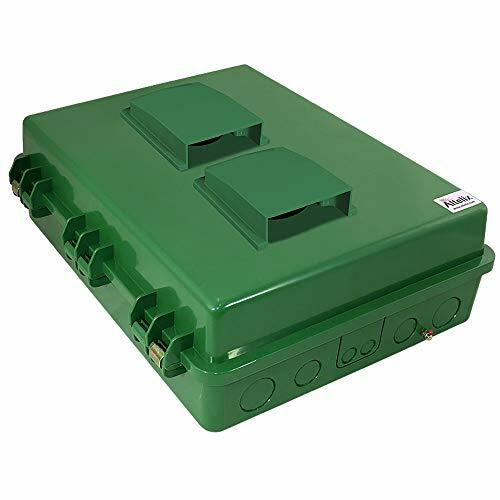 NEMA Type 3R, 3RX / IP24 Rated, UV-Stable and Weather Resistant Rain-Proof Enclosure for Protecting Devices from Tampering, Harsh Environments, Dust and Water Ingress. Inside Space for Equipment Up to 14" x 9" x 4.2" Max. Outside Dimensions: 16.5 x 12.5 x 5.3 Inches. Easy to Drill and Modify for Unique Installations. 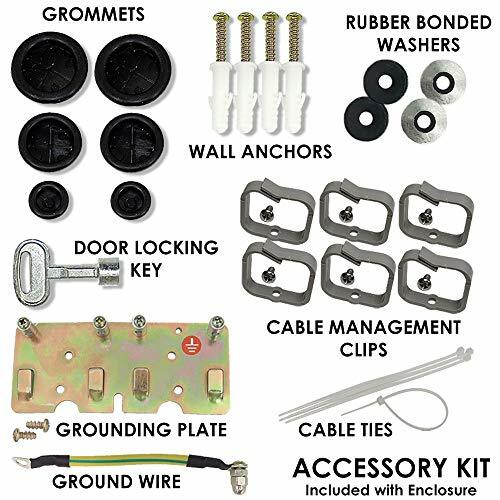 Includes Assortment of Cable Grommets and Wall Mounting Hardware.